Like many girls growing up in the ‘80s and ‘90s, I wanted to live in Sweet Valley. I wanted to hang out with the Wakefield twins and cruise around in their red Fiat Spider and chow down at the Dairi Burger. 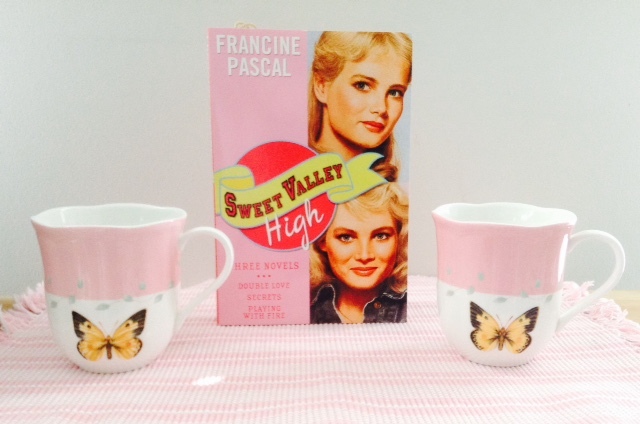 I devoured not only Francine Pascal’s Sweet Valley High books, but the super scandalous Sweet Valley University series and the Sweet Valley Sagas that chronicled the ancestral stories of the Patmans and the Fowlers. 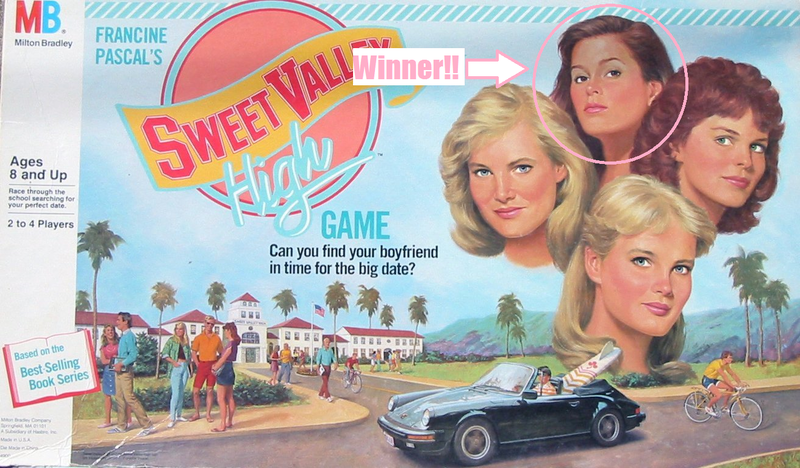 And, of course, when playing the Sweet Valley board game, I just had to be my favorite character, Lila, because she had brown hair and was sooooo glamorous. I recently decided to have a little flashback fun and reread the very first SVH novel, Double Love, to see if it stands the test of time. Turns out, some things never change. Elizabeth and Jessica Wakefield are still the coolest teenagers on the planet. Bruce Patman is still an arrogant jerk in a black Porsche. Ken Matthews is still obviously the hottest guy to ever play for the Sweet Valley Gladiators. But there are some things that I must have missed twenty-something years ago, things that I’m seeing now in a whole new light. Here are my major discoveries from re-reading Sweet Valley High #1: Double Love. When I was a kid, I knew that I should have liked Elizabeth better, but she felt so much more boring than her mischievous, younger (by four minutes) twin. Now, Jessica’s deeds feel downright wicked. She knows that her sister is googly-eyed over Todd Wilkins, but she intercepts his phone calls, sneaks away with him when he’s supposed to be meeting Liz under the clock, and lies, lies, lies to everyone she comes in contact with. Worst of all, she lets a cop believe she’s Elizabeth when she gets caught, underage, in the middle of a bar fight! Then she cries about it and everyone forgives her because she’s Jessica Wakefield. At least Elizabeth and Todd smarten up in the end and have her tossed in a pool fully clothed—but next time you decide to give your twin a taste of her own medicine, Liz, make sure she’s not wearing your new freshly-pressed jeans and favorite blue button-down, okay? That chlorine is going to be a killer! Elizabeth Wakefield is a secret gossip?! Jessica Wakefield has the worst taste in guys. Rick Andover, Jessica?! Rick Andover?! The most outrageous guy at Sweet Valley High, until he dropped out six months ago?! This guy drives around, smelling of leather and gasoline, and calls you “Heaven.” Who cares if he looks like a young Clint Eastwood? Who cares if he’s got an eagle emblem tattooed on his bicep? Getting in that Camaro with a guy who says, “I’ve seen the merchandise, baby, and I’m sold,” is a terrible, terrible idea. Enid Rollins is a terrible friend! I get it. He’s the captain of the basketball team, he’s tall, dark and handsome, and he’s BFF with Ken Matthews, the King of Sweet Valley High. But he is so dense. First, he believes the rumors about Elizabeth going off to a bar with Rick Andover. Then, when Jessica confesses that she was actually the idiot who went with Rick to Kelley’s Bar, Todd says, “I’ve never heard anything so noble. You’d take the blame for your sister? I’m taking you to the Phi Ep dance!” Come on, Todd. Get it together! Or should I say, come on, Liz and Jess. Find someone a little more worthy to fight over. Like Ken Matthews. Ned and Alice Wakefield are…interesting? When I was a kid, I’d get to the storylines about the Wakefield parents and think, “Who cares? I need to find out what’s going on with Ken Matthews!” Ned and Alice were the parents who popped in and took the Fiat keys from Jess and told the girls that there was cold soup in the fridge. Now I’m intrigued by their secret lives. Why are they never home for dinner? How’s Alice’s interior design business going? Is there something going on with Ned and that Marianna West from the office? Imagine my disappointment, discovering that Ned’s only “secret” is that Marianna’s making partner at the law firm. Oh well. I can keep hoping for more intrigue in Book Two. My main takeaway from re-reading Double Love is that I clearly have to reread Sweet Valley High #2: Secrets next. What else will I learn about the Wakefields that I missed the first time around? Will Enid win me over? Will Ken Matthews still be the dreamboat I remember? Will we finally get more Lila Fowler? (Because, if I’m being honest, there wasn’t enough of her in Double Love.) Only time will tell. In the meantime, I’ll be researching what a lavalier necklace actually looks like, because another benefit of reading these books twenty-plus years later? Google. I loved this post, I read SVH books when I was younger. I never got to the Uni ones, but I’m sure they were fab. I think a lot of the reasons you have given is why I haven’t re read my childhood books, I want to remember them to be amazing. If you write more posts on SVH though, I’d love to read them. Thank you so much, Amanda! It was deliciously fun to re-read and reminded me just why I loved the books so much, even when I wanted to shake the characters. I can’t wait to read more, and I will definitely write about my experience with them!! omg, SVH! I feel like you just popped me into a time machine and we are having sleepovers, taking turns reading out loud to each other out of our SVH books. (Ahem, The Evil Twin? I think we need to re-read that one together). I love this blog so much!!! Thank you!! I definitely want to re-read The Evil Twin! I also want to re-read some of the SVU books. At the time, they seemed sooooo racy. I wonder if they still are? What a blast from the past! I was always a team Elizabeth girl. But then again, my favorite Baby-sitter was Kristy Thomas. I was a borning honor’s kid who liked other boring honor’s kids. Go figure. Also, my memory is sketchy, but was there some kind of Unicorn Club at SVH? Thank you!! I think the Unicorn Club was from Sweet Valley Twins, when they were in middle school. In high school, they were all about Pi Beta and cheerleading and The Oracle. You and me BOTH!!! Thank you! !